With the time, there are many of the changes in the financial transactions that have evolved with different processes in the market. 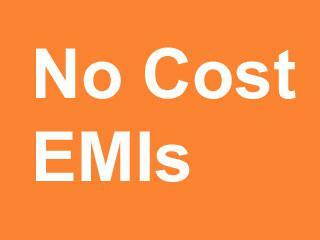 Among many of the terms that have been introduced, the term” NO COST EMI” has influenced most of the individuals. It is termed as the type of transaction where the buyer is not charged any of the processing fees. Apart from it, there is no interest charged for the amount that you have used under the provision of No Cost EMI. To make it clearer, we can say that suppose if you have carried out a purchase with no cost EMI for around 20, 000 Rs, then the EMI that would be charged from you for every month would be 2, 000 Rs for the tenure of 10 months. Hence, you will only pay for the amount you have used to purchase. There will be no processing fee or any hidden charges, interest for the amount payable. In contrast, if you opt for a regular EMI option, there will be interest rate as well as a processing fee. The interest rate is not fixed, it might fluctuate from 8 to 15% where as the processing fee might be charged in between 0.5% to 3% in total. This means, by opting for no cost EMI, you might end up saving a lot of amounts. With a no cost EMI, you will be charged 0% processing fee and 0% of rate of interest for your purchase, which makes it a must to go for option if you are looking to make a purchase on monthly installments. It is interesting to know that in case of regular EMI’s, your credit card will be directly offering you the provision to have monthly installments for your purchase with an existing interest rate as well as a processing fee. This might differ from product to product or from bank to bank. On the other hand, if you wish to opt for No- cost EMI, it is created and offered with a joint collaboration of loan providers as well as with the company or retailer from where you are planning to buy a product. Companies such as Bajaj Finserv, Fullerton India etc have already co- partnered with many of the credit card companies and are offering the provision of No cost EMI to their valuable customers. However, with the credit card EMI offers, one has to pay the monthly installment on time, otherwise he or she will be charged penalty for this amount. This penalty will keep on increasing every month until you have paid the amount. It is necessary to have a no cost EMI card if you want to opt it from any of the finance company. The limit and credit of the card depends on various parameters such as your bank, your annual income as well as your credit score in the market. There are many Banking institution which provides you the service of ‘No Cost EMI’ with credit cards in partnership of e-commerce companies namely, Standard Chartered, Axis Bank, HDFC Bank, Yes Bank, ICICI Bank, HSBC, Citibank, Kotak Mahindra Bank, SBI, RBL. This concept has been introduced long before but in 2013, the Reserve Bank of India has banned many of the bank institutes to offer 0% EMI scheme on various retail products. Many of us think that no cost EMI means one has not to pay any of the interest. But that not true completely. It is known to us that on and off many of the schemes and offers comes on a product ,that keeps on changing with due passage of time. But do you know, that if you opt for no cost EMI, your bank will indirectly take that offer away from you. They will not give you the privilege of using that discount or offer on that particular product, making it as a compensation for the interest that you might not pay on the pretext of No cost EMI. If you calculate the cash back or the discount price of the offer, you will find it that more or less, it will account the same with the amount of interest, you might be asked to pay if you go for regular EMI procedure. Hence, directly or indirectly , you end up paying the interest for the EMIs, even in the cases of No Cost EMI. However, there are only selective banks that offers this provision of No cost EMI. Before initiating the purchase, it is important to check whether your bank is offering the provision of No cost EMI or not. And it is also advised to compare it with the regular EMI options as well as existing schemes for the same. You will be surprised to know that there are three stakeholders in the no cost EMI. The retailer, bank as well as the consumer. The consumer must have a credit card from the bank, if you wish to get enrolled in the No cost EMI. Moreover, you can opt for an EMI card from the various non- banking finance company. In such cases, the banks are replaced with this non- banking finance companies. One might have to pay the fee for the EMI card also, issued by these non- banking finance companies. Is it wise to opt for No cost EMI? There are several banks that offers the provision of no cost EMI on various e- commerce websites. For example, if you scroll the mobile, electronic section, you would find that your bank offers no cost EMI option for the purchase of the product. Depending upon your requirements and the product actual and offer price, one should opt for the best available option. Sometimes, if you calculate, you will find that having a regular EMI with great offer is a good to go option as compared to the NO cost EMI. This is so because while availing the no cost EMI , you might miss the heavy discounts or cash back offers that are available on that particular product. It is recommended to study all the aspects and parameters related to the monthly installments , before moving ahead with the option of No cost EMI.